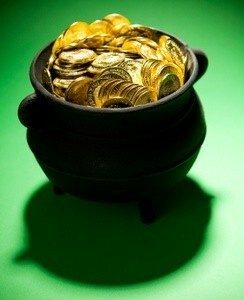 St. Patrick's Day is a great time to cook up some traditional Irish recipes. This page contains St. Patrick's Day recipes. *Note: I have often substituted Bailey's Irish Creme for the milk with delightful results. Cream the butter and sugar with the mashed potato, then add the cocoa. Add the beaten eggs, alternately with the flour and the salt. Finally pour in the milk, mixing well, to make a soft dough. Well grease two 8 inch cake pans and divide batter equally between them. Bake at 350 degrees F oven for 25-30 minutes. The top will be springy to the touch when done. Cool for a few minutes, then turn out onto a wire rack. Frost with whipped cream or desired frosting. To make this cake a truly decadent chocolate dessert, frost with fudge frosting using Bailey's Irish Creme, cocoa and 10X confectioner's sugar. If you choose to use whipped cream, you can add the Bailey's Irish Cream to the heavy cream when you're beating it. Reduce any sugar and add no extra flavoring to the whipped cream. Source: My friend Linda who is from northern Ireland. 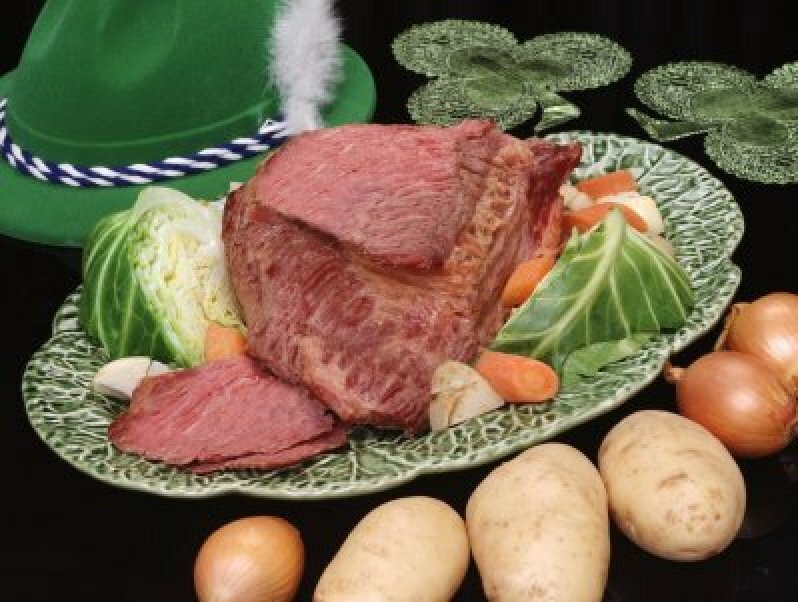 Most folks celebrate St. Patrick's Day with a traditional Corn beef and Cabbage meal. Even on sale, Corned Beef can be very expensive if you are feeding a lot of people. Also Corned Beef can be tricky to cook if you are a first time cook. These two great recipes can replace a costly corned beef and cabbage supper for your St. Patrick's Day Dinner, or maybe you are just tired of corned beef and cabbage. This is a hearty soup with sandwich idea that may become a hit with your family. Home made soup always tastes better and is less costly than canned but you could really make this fast by using a good canned soup and just heating it up. Also the soup can be made in a crock pot. Just remember to add the milk and butter last and to let the soup cool a little so you don't curdle the milk. In small fry or sauté pan, sauté the onions and carrots and celery until the onions are translucent. Put the potatoes in the pan with enough water to cover. Add onions and carrots and celery. This is a great slow cooker on the stove so turn your heat down to low and let it simmer all day. I like a thick smooth soup so I let mine go all day but if you prefer a chunky soup cook for 2 hours. Add milk and butter and serve. Heat your corned beef or pastrami in the microwave until warm. Put corn beef or pastrami on the bread layer on your Swiss cheese and Coleslaw. Serve with your Pot of Gold Potato soup for a filling dinner. Happy St. Patrick's Day to You and Yours from Me and Mine! 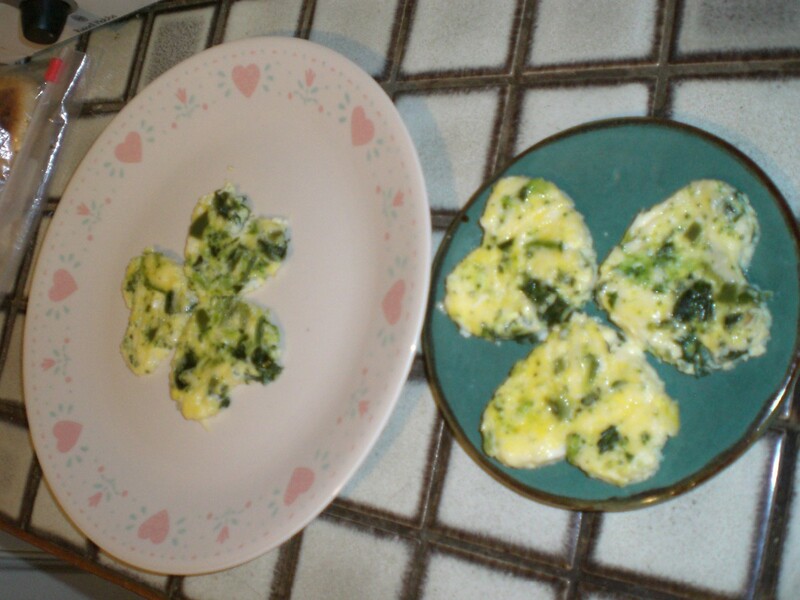 Here's a cute little idea for St. Patty's Day breakfast or any time that day, a clover shaped egg dish! I found this healthier version of Dublin coddle in my local newspaper a few years ago and have made it every St. Patrick's Day since. A green jello cream cheese, fruit and nut salad to celebrate St. Paddy's Day!